The Sun UK reports that some very young schoolgirls have been caught planning to kill their own classmates and then ‘drink their blood’.The two girls, ages 11 and 12, were found armed with knives on Tuesday at Bartow Middle School in Florida. Two Satan-worshipping schoolgirls in America have been charged with conspiracy to commit murder after police found out and foiled their evil plot to kill classmates, cut them up and drink their blood. The sick duo, aged 11 and 12, were found armed with knives at Bartow Middle School in Florida, where they planned to “kill anywhere from 15-25 students,” an affidavit said. They intended to slice their victims’ throats, cut up their bodies, eat their flesh and drink their blood, authorities added. The students then planned to fatally stab themselves. 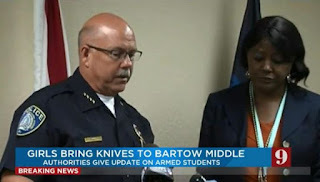 Bartow Police chief Joe Hall told a press conference that on October 22, a teacher at Bartow Middle School was informed that the 11-year-old had warned another student not to go to a particular building as “something bad is going to happen”. On Tuesday, several police officers and sheriff deputies descended upon the campus due to the “possible threat”. During a search, police found this hand-drawn map, setting out their twisted plans. After a search, both students were found near a bathroom: “At that time the girls had a goblet, or a glass, in their possession,” Hall said. At first it was thought they had been consuming alcohol, and they were escorted to the principal’s office. But when one of the girls was told to empty her pockets, she retrieved a pen knife and a sharpener. When asked why she had a weapon, the girl allegedly stated that the pair, “were planning on attacking and killing as many students as possible”.Police officers searched both pupils in the office, and found they were in possession of four knives, including a butcher’s knife, a pizza cutter and a knife sharpener. Detectives were allegedly told they had been planning an attack on other students for the past couple of days and that they “wanted to kill at least 15 people”. Hall said they “were waiting in the bathroom for the opportunity to find smaller kids they could overpower to be their victims. “Both juveniles stated they are practising Satanists.”Officials with Polk County Schools said that extra police officers and guidance counsellors would be at Bartow Middle School (above) this week. During a further search detectives found a hand-drawn map with the layout of the school, which included the notation “go to kill in bathroom”. Both girls have been arrested and charged with conspiracy to commit murder, possession of a weapon on a school property, concealing weapons and disruption of a school’s function. It will be up to prosecutors to decide whether the girls will be charged formally as juveniles or adults, Deputy Police Chief Bryan Dorman told Associated Press. The affidavit said: “The plan was to kill at least one student but were hoping to kill anywhere from 15-25 students. Detectives said the girls devised the plot while watching “scary” movies at one of their homes over the weekend. Polk County Schools officials said that extra police officers and guidance counsellors will be at the school this week. “School staff quickly responded to a report of suspicious behaviour; the students were taken into custody, and no one was harmed,” school officials said in a tweet. Bartow Police chief Joe Hall said on Facebook today: “I understand that the recent news of a plot to kill students at Bartow Middlle School is troubling. Praising school staff and police officers for “thwarting this plot from becoming a tragedy”, he added that “there are several measures in place to make sure our children are safe and that all threats of violence are addressed.